For some students, sentence transformation is the test they are really scared of. They feel that they cannot form the sentences correctly and often fail their exams just because they mess this part up. However, as a learner and teacher of English, I feel that this test is simple. I cannot help thinking that the same phrases get repeated all the time and that it is enough to learn a set of around one hundred phrases and you are fine. To test my notion, I created a set of materials to teach some highly productive phrases which appear in this test. In this post, you will find an infographic with 16 phrases, a worksheet where students will memorize the phrases and an online quiz where the students can test their ability to use the new phrases to transform sentences in English. In this infographic, I tried to organize the phrases clearly and easily. In the white box, there is one way of saying something and below in the colourful box, there is another way of saying the same thing. First, students should read the phrases and translate them. If you do not teach a monolingual class, explain the phrases your students do not understand or ask them to use the Google Translate service (it has improved a lot recently). In the second worksheet, students try to solve the puzzles using the phrases they have learnt above. In the first exercise, students should fill in the missing letters to complete the phrases. In the second exercise, students find the phrases in the wordsearch. They have to fill in the missing vowels (A, E, I, O, U, Y), too. In the third exercise, students try to find the phrases in the squares. Students can check their answers in the key below. In the following exercise, students have a chance to apply what they have learnt. Their task is to transform the sentences so that they have the same meaning. For the full-screen quiz, click the button below. 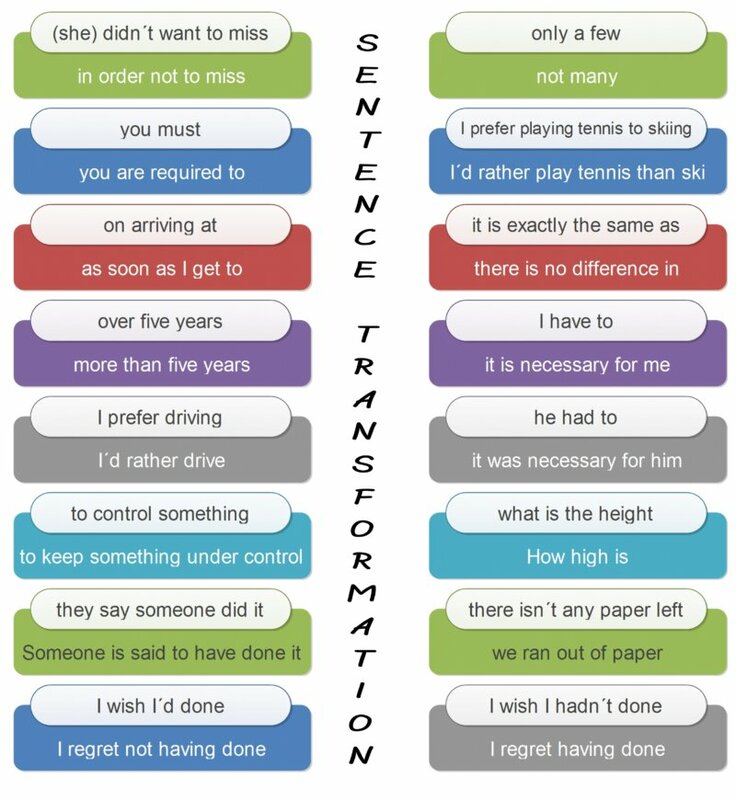 You can find more exercises to practise sentence transformation at British Council site. Thanks for sharing with us such a nice article. Thank you for such a wonderful set of material.